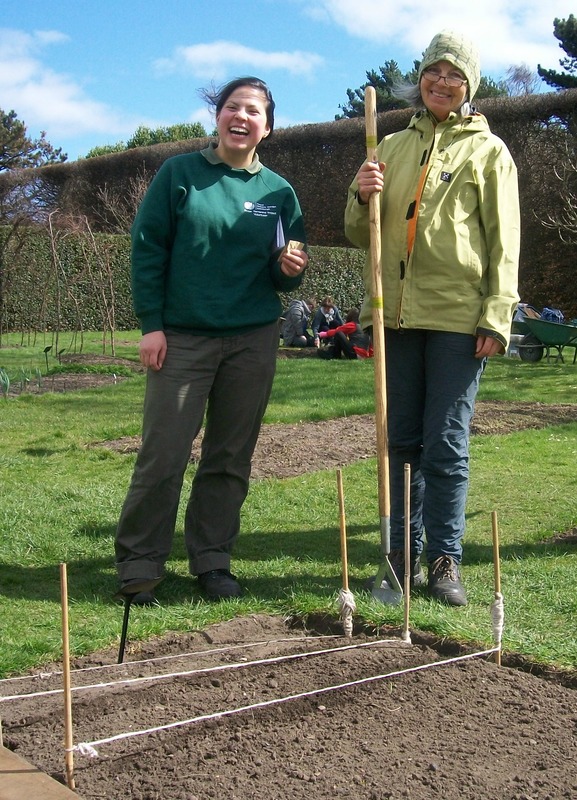 April is a busy time for the volunteers and community groups that work on the Edible Gardening Project at the Botanics. As the weather improves and the soil warms up it is time to plant seeds outside and watch out for weeds. There is a great range of seeds that can be sown outside from April onwards, especially if we get a spell of warm, damp weather. Lettuce, beetroot, broad beans, kale, cabbage, turnips, carrots, parsnips, peas, radish, spinach, spring onions and chard can all be sown now. Warm soil promotes speedy germination; if the weather is cold delay sowing. Seed sown later into warm soils tend to catch up with earlier sown crops. To help warm the soil it is possible to cover it with black plastic two weeks before sowing. It is a good idea to sow your seeds in straight rows and mark the rows at each end with a cane or label. This means the emerging vegetable seedlings are clearly identifiable – weeds don’t grow in straight lines! It should then be possible to hoe between the rows of vegetables to keep the weeds under control. Young seedlings are very susceptible to being under- or over-watered. Check them regularly, the soil should be kept just damp. Water as necessary with a watering can that has a fine spray. 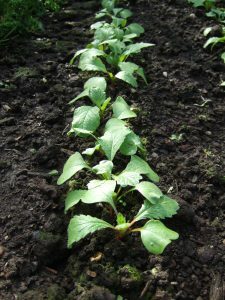 Once the seedlings are established and have grown a few leaves it is important they have enough space. Seed packets usually contain details about how far plants need to be spaced apart. Thinning out seedlings can feel brutal but it is an essential task for crops to reach their full potential. Water the plants prior to thinning. Select the largest, healthiest looking seedlings to keep. Grasp the unwanted seedlings as close to the ground as possible. Gently pull the plant out of the soil, avoid disturbing the remaining plants. Small seedlings such as carrots and lettuces can be snipped off at ground level using scissors. After thinning your plants water again, this helps to re-settle the soil around the roots. The thinnings needn’t go to waste; you can add them to salads. Potatoes are a productive and rewarding crop to grow; the best time to plant them is April. To plant the potatoes dig a narrow trench 12.5cm deep. In the trenches place ‘early’ seed potatoes 30cm apart and maincrop varieties 37.5cm apart. The rows should be 60cm apart for earlies and 75cm 30in apart for maincrop. As the potato plants emerge mound the soil over them to protect the leaves from frost. This is known as ‘earthing up’. The end of the April is a good time to start sowing tender, frost sensitive crops such as runner beans, French beans, courgettes and pumpkins. These can only be planted into the garden once the risk of frosts has past, in Edinburgh this can be as late as June. 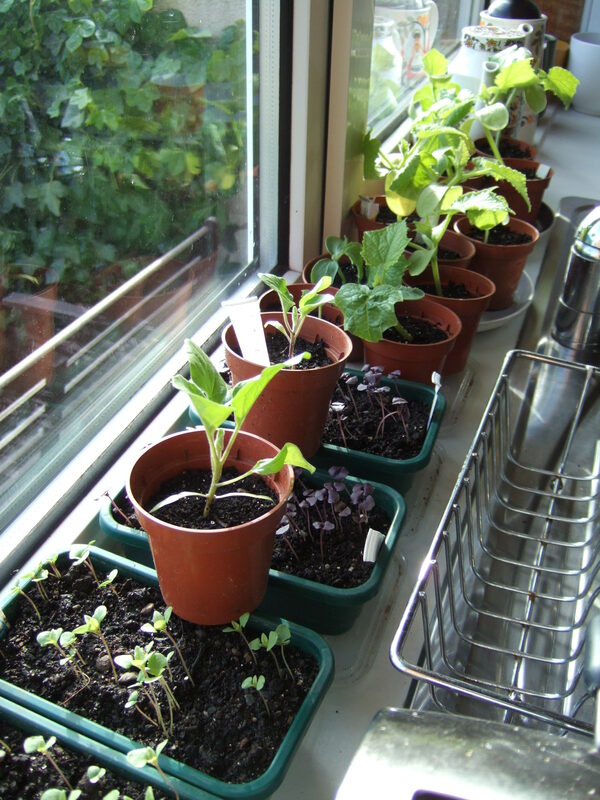 The seed should be sown in pots in a polytunnel, greenhouse, cold frame or windowsill. Beans have a deep tap root so need to be planted into deep pots, old toilet roll tubes or specialised pots known as ‘root trainers’ are ideal. Courgettes and pumpkins grow very quickly so a minimum pot size of 9cm (3.5inches) is required to prevent them becoming pot bound before they are planted out. Crops that have been started off early indoors need to be gradually acclimatised to outdoor conditions before they are planted into the garden. This is known as hardening off. Over the course of several days take the plants outside for progressively longer periods of time. After a week or so the plants should be ready to plant out.